This semester, the McGill Institute for the Study of Canada (MISC) welcomes a Special Visitor, the Hon. Ken Dryden, who will be teaching a new course in Canadian Studies, “Thinking the Future to Make the Future.” A legendary goaltender who won six Stanley Cups with the Montreal Canadiens dynasty of the 1970s, a former Member of Parliament, and a best-selling author, Dryden now brings his “A” game back to McGill, where he earned a degree in Law in 1974, to give a course on the issues he feels passionately about – Canada, Canadians and the future. This semester, the McGill Institute for the Study of Canada (MISC) welcomes a Special Visitor, the Hon. 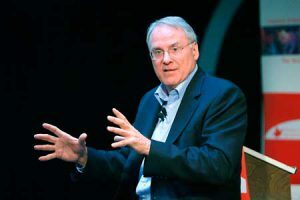 Ken Dryden, who will be teaching a new course in Canadian Studies, “Thinking the Future to Make the Future.” In taking on this new role, Dryden is adding yet another title – university lecturer – to his already crowded resume. A legendary goaltender who won six Stanley Cups with the Montreal Canadiens dynasty of the 1970s, a former Member of Parliament, and a best-selling author, Dryden now brings his “A” game back to McGill, where he earned a degree in Law in 1974, to give a course on the issues he feels passionately about – Canada, Canadians and the future. This is a course about the future. The focus will be on selected issues facing Canada over the next few years and students will speculate about possible futures for the country and imagine a role for themselves in building these futures. Issues we will tackle include: entrepreneurship and innovation through politics, the arts, journalism, health, sports, education and the environment to name a few. There will be invited speakers, leaders in their fields who will share their expertise with students and help to challenge them to think differently about their roles in creating the future. I have been working on these ideas for some time, and a few years ago when I wrote the book, Becoming Canada, I started thinking: what as Canadians is our real story for ourselves and our future? How do we understand ourselves? Whether you are an individual, a corporation or a team – that basic understanding you have of yourself is hugely important to the kind of result you have in the end. For a corporation, it’s called “corporate culture,” teams call it “tradition,” but it’s the same sort of thing for a country. Well, each of these students will live approximately 60 more years and have 40 years of work life ahead of them, and the changes in those 60 years will be great. The goal will be not only to identify those changes but to ask if they will be spectators to those changes or the participants: to start thinking the future as a way to make that future. How did this optimistic outlook inspire you personally? Well, it’s a philosophy that anyone involved in sports can tell you about. It’s the approach that there is always an answer, a way to make something happen. As a part of a team, you always believe there is a way to win against the team that beat you last 6-1; you have a plan in your mind that you can create a different result. Even as a 10-year-old kid playing street hockey, that is a powerful approach. How much impact can this kind of thinking have? We are essentially hopeful people. That is why even in certain teams who have not won in… forever, they can turn fans hopeful who were cynical. There is huge energy behind hope and optimism, but no energy behind cynicism, skepticism or pessimism. It is easy to be right about those things that are wrong and go wrong, we all have lives to live and we try to make those lives better. In terms of public questions, it is really critical to think in those terms and ask: what might that world to be like? What was your most rewarding role? I can’t really say – there have been so many. I don’t see myself as a writer, just someone who writes, or as a hockey player, I am someone who plays hockey, and not as an MP, someone involved in politics. And there are so many different highs, like twenty thousand people screaming when you win a Stanley Cup, and also a quiet pride, like when a childcare agreement is signed. I think Canada is a pretty terrific place but our understanding of ourselves is not nearly as terrific as we are, and what we can be. Canada will play an important role in the future – and there are a few ways in which we can and should. What I really love is to see people who really get caught up in whatever it is they are doing, when they get immersed in it and forget everything else and become good at it. They have unknown impacts on themselves and others. That is the fun of watching teammates and of watching people get better. We are all at our best when we are engaged in something that makes us forget about ourselves and makes us focus on something outside of ourselves. This could be an article we are writing, or a conversation. I have been lucky to have many chances to get so absorbed. That is the fun of this.